As a short reminder, Robert's Snow: For Cancer's Cure is an auction where you can "own a piece of art from your favorite children's book illustrator while helping to fight cancer. Participate in Robert's Snow: for Cancer's Cure, a unique fundraiser for cancer research. Since 2004, this online auction has raised over $200,000 for Dana-Farber, and with your help, we can continue this holiday tradition in 2007." The artwork is a five inch wooden snowflake, decorated by a children's book illustrator. Robert's Snow was first a children's book, written by Grace Lin and inspired by her husband, Robert Mercer. More information on the project is here. Grace is one of the Blue Rose Girls bloggers, and Jules and Eisha explain at Seven Impossible Things... how we bloggers got involved in the project. I am highlighting five of the illustrators who have contributed snowflakes. This year, there are several auctions, starting in November and ending in December, with hundreds of illustrators donating time and talents to produce the snowflake art. Go here to look at the artwork, and to bid once the auction goes "live." Please note that not all the illustrators are being highlighted by bloggers. And now, here's Rebecca Doughty. Some Helpful Tips for a Better World and a Happier Life will be published April 2008. 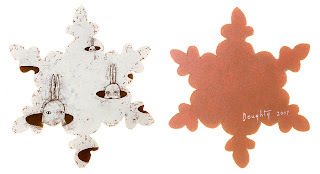 Doughty's snowflake is part of Auction 3: December 3 - 7 , and is called "Flake With Holes" by Rebecca Doughty. More information about Doughty and her work can be found at The Schoolhouse Gallery. Liz B: I blog not just about books; but about how important story is in our lives. What children's book or children's book illustrator has most inspired you? Rebecca: Tough question... so many! One special favorite was: Boats Finds a House by Mary Chalmers, a poignant story about a little wandering cat in search of a house, and what makes a house a home. I was also a huge Dr. Seuss fan. His books gave me a love for the music and play of language. I often gravitated toward pared-down artwork, deceptively simple drawing that left much to the imagination. Harold and the Purple Crayon by Crockett Johnson comes to mind. And I've always been partial to black and white. I adored my storybooks, but I was also absorbing all the pop culture of the time, (the 60's that is) comics and funnies, TV cartoons, Mad Magazine, and cartoonists like Charles Addams. Edward Gorey was another favorite. At an early age I was intrigued by humor and satire, and stories with deeper, darker subtexts. Liz B: How did you get involved with Robert's Snow? Rebecca: I met Grace and Robert in the spring at an exhibition at The New Art Center in Newton. I then became more familiar with Grace's work and the Robert's Snow project. When my agent Rebecca Sherman spread the word about this years' auction, I threw my name in the hat. There are many worthy fundraisers, and artists are often asked to contribute their art, but it becomes much more meaningful to participate when you're creating something especially for a project, and something outside the way you'd ordinarily work. Making a flake for Robert's Snow was like that, I felt more connected to the cause, and that was particularly satisfying. Liz B: What inspired your snowflake? Rebecca: In recent years I've been working on paintings using a group of odd little animal characters in psychologically charged narratives. Rabbits and holes appear often in the work. They're very small paintings but suggest vast landscapes, often with something disappearing off the edges of the painting. I thought this would translate nicely onto a snowflake. I imagined the flake as a tiny window to the snowy field, with many bunnies and holes beyond. Liz B: Could you tell us something about your upcoming book, "Some Helpful Tips for a Better World and a Happier Life"? Rebecca: I often listen to public radio while I'm working, and I also live in a busy city, so I'm too often reminded of how messed up the world is, how rotten people treat each other, and themselves, and the planet. So, instead of continuing to complain, I thought it might be time to make a positive contribution in some small way. I figure the best way I can do that is through my work, and with humor, so this is a funny book about spreading a little happiness and kindness around. Liz B: Thank you so much! I love this - it's disturbingly funny. Yes, strange and wondrous -- and I love it! A definite top-tenner. Thanks, Liz, for the great write-up! "with many bunnies and holes beyond." Oh yeah. A thinking woman's snowflake. I love it. It was interesting to find out what inspired Rebecca's snowflake. I had thought it might have been Louis Sachar's book HOLES. What an intriguing little group of rabbits. Cool. Thanks, Rebecca and Liz.